Why did the Gates and Soros not drink glasses of Glyphosate themselves but send it to us to use? Alles gaan oor mag en beheer en om die bevolking te verminder. Grootskaalse mediese uitgawes gee aanleiding tot hul ander maatskappy. Is al hierdie dinge juis so geplaas om die toestande van mense deur plaasprodukte veroorsaak word en die skuld dan voor die deur van boere gelê kan word. AGRISA word ook gefinansier deur Monsanto… Boere moet gerus sorg dra wat hulle aan ons verkoop en indien dit Monsanto produkte bevat, dink twee keer vir al daardie gesondheidseise. Mense wat sieklik of gebreklik is, gaan nie Soros of Gates dagvaar nie, dis die boer wat plant en verkoop. Mike Papantonio and Author Carey Gillam discuss her new book which reveals how Monsanto viciously worked to cover-up the fact that their weed-killer could cause cancer. Patrick Moore said glyphosate, a key ingredient in the Monsanto pesticide Roundup, was safe to drink. But he balked when offered a glass of it. The Doctors and toxicologist Donna Farmer discuss a recent report issued by the International Agency for Research on Cancer, which states that glyphosate, a widely used herbicide, may cause cancer in humans. Jeffrey Smith, founder of the Institute for Responsible Technology, joins the conversation and notes that Monsanto has been convicted, both by a New York state court and a French court, of lying about the toxicity of glyphosate. Here is the fundamental question that leads to all of those separate issues: Why do farmers WANT to use Glyphosate? What’s the benefit if it is indeed so dangerous? 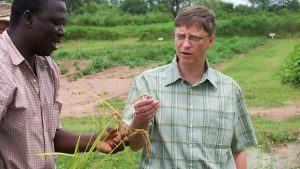 In the last four years, the Bill and Melinda Gates Foundation has donated a total of $15 million to two global campaigns aimed at “ending world hunger” by expanding the use of GMO technology. The first, called the “Alliance for Science,” was created in 2014 with the intention of “depolarizing” the GMO debate. Both campaigns are headquartered at Cornell University. The Alliance for Science has received $12 million from the Gates Foundation so far, while Ceres2030 was founded with a $3 million grant last October. The funds for the Alliance for Science will be used “to ensure broad access to agricultural innovation, especially among small farmers in developing nations,” says a Cornell University press release. The Cornell Alliance for Science is launching a “$10M by 2020” campaign, seeded with a $6.4 million grant from the Bill & Melinda Gates Foundation. Funds raised during the campaign will support the Alliance’s global efforts to ensure broad access to agricultural innovation, especially among small-holder farmers in developing nations. The Alliance was founded in 2014 with a $5.6 million grant from the Gates Foundation. It has grown into a progressive international network that has trained nearly 400 science advocates representing 35 nations. They work in their home countries to communicate effectively about science and champion evidence-based agricultural policies. The Alliance trains grassroots organizers through a series of short courses taught in partner countries, along with a 12-week Global Leadership Fellows program on campus. The Alliance also produces and disseminates multimedia that tell the stories of scientists and farmers engaged in agricultural innovation initiatives around the world. It partners with many organizations and institutions and has built a network of more than 9,000 science allies representing more than half the world’s countries and every U.S. state. Joan Conrow is managing editor for Cornell Alliance for Science.